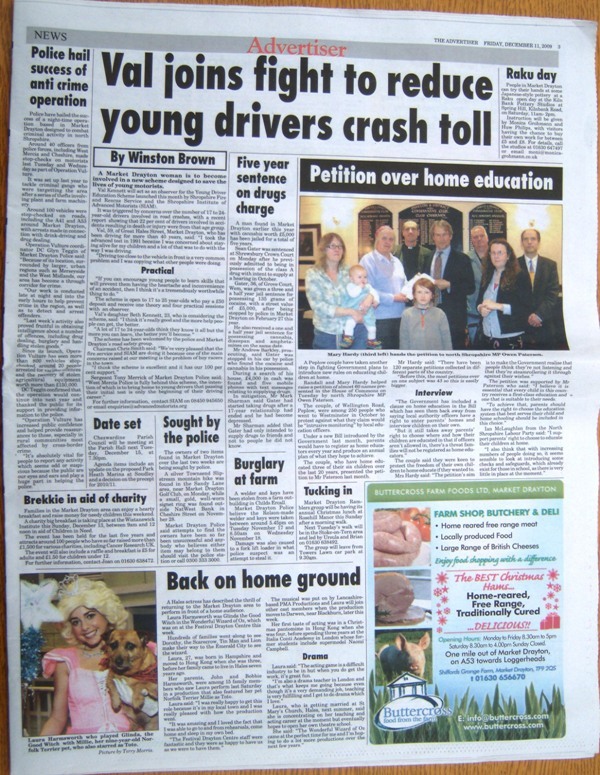 The Market Drayton Advertiser also followed the presentation of the petition in the House of Commons with a report, though it suffered from something of a time delay! It was about Owen Paterson receiving it from Mary and others two weeks earlier! A Peplow couple have taken another step in fighting Government plans to introduce new rules on educating children at home. 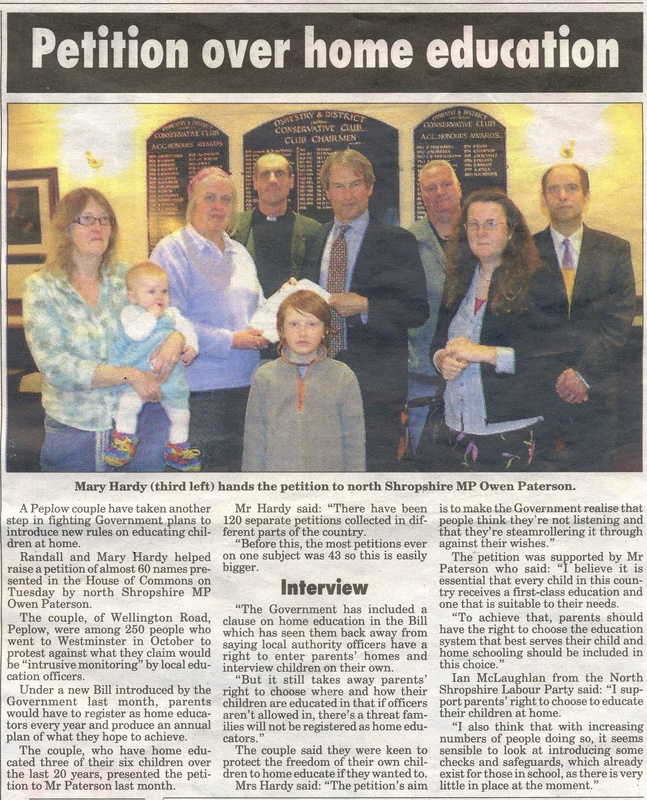 Randall and Mary Hardy helped raise a petition of almost 60 names presented in the House of Commons on Tuesday by north Shropshire MP Owen Paterson. The couple, of Wellington Road, Peplow, were among 250 people who went to Westminster in October to protest against what they claim would be “intrusive monitoring” by local education officers. Under a new Bill introduced by the Government last month, parents would have to register as home educators every year and produce an annual plan of what they hope to achieve. The couple, who have home educated three of their six children over the last 20 years, presented the petition to Mr Paterson last month. Mr Hardy said: “There have been 120 separate petitions collected in different parts of the country. “Before this, the most petitions ever on one subject was 43 so this is easily bigger. “The Government has included a clause on home education in the Bill which has seen them back away from saying local authority officers have a right to enter parents’ homes and interview children on their own. The couple said they were keen to protect the freedom of their own children to home educate if they wanted to. The petition was supported by Mr Paterson who said: “I believe it is essential that every child in this country receives a first-class education and one that is suitable to their needs. Ian McLaughlan from the North Shropshire Labour Party said: “I support parents’ right to choose to educate their children at home.